These honey glazed stuffed chicken breasts make for a really nice presentation. The stuffing is gluten-free and dairy-free, and combines spinach with shallots and ground almonds and the sweetness of dried apricots and basil, making it a great dish to serve for the Jewish New Year, Rosh Hashanah, when it is tradition to serve something sweet and fruity. 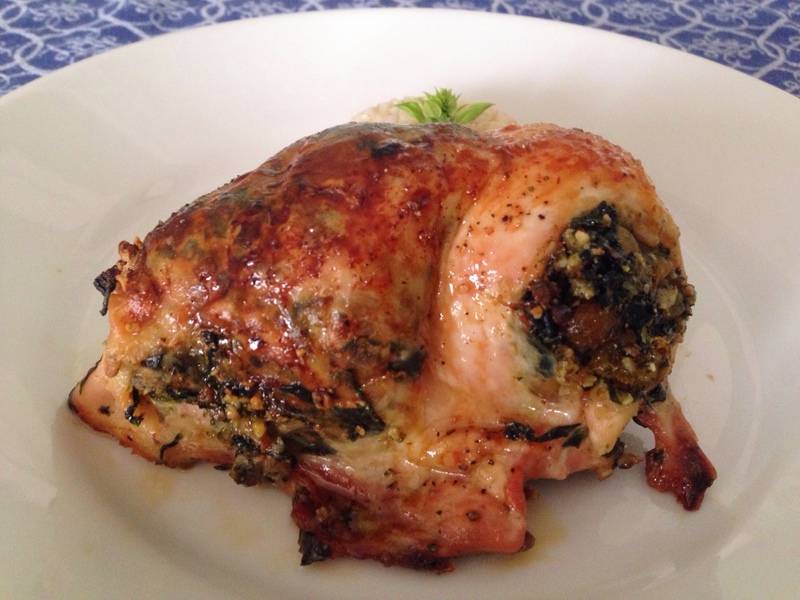 The stuffing is inserted inside the chicken breast and underneath the skin, making for a nice chicken-to-stuffing ratio for almost every bite. To make the stuffing, combine the almonds and basil in a processor and process until the almonds are pretty fine, with no big pieces. 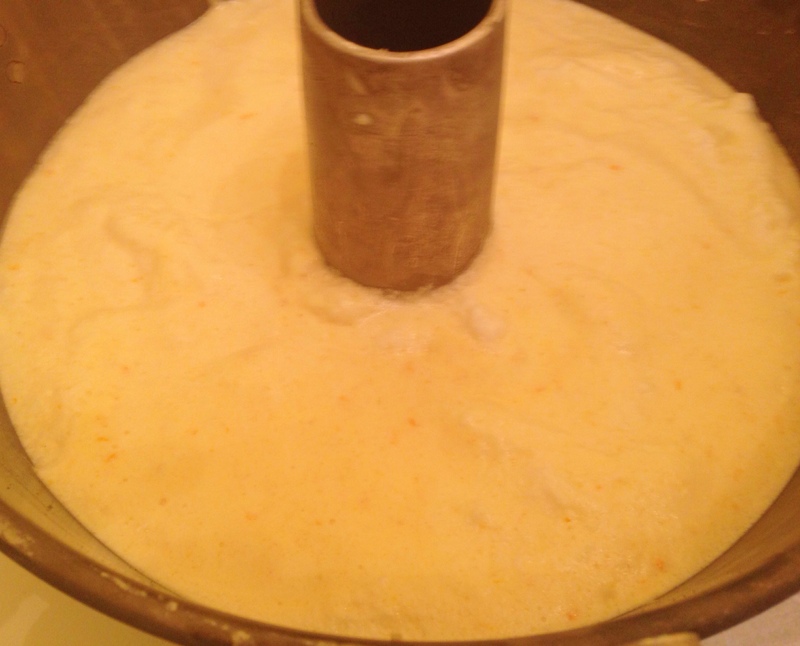 The basil and almonds will be mixed through thoroughly. 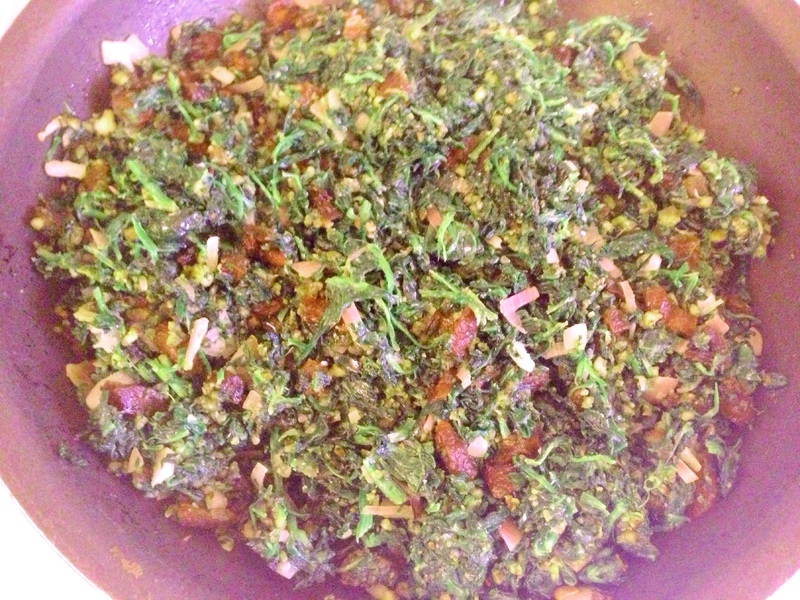 Add the almond basil mixture to a non-stick frying pan. Defrost and drain a box of frozen chopped spinach and squeeze the excess water out with paper towels. Add one cup, tightly packed spinach into the frying pan along with the chopped shallots, chopped dried apricots, 4 tablespoons of olive oil grated garlic clove and salt and pepper and sauté for 3 minutes. To stuff the inside of the chicken breasts, find the pocket on the side of the joint. 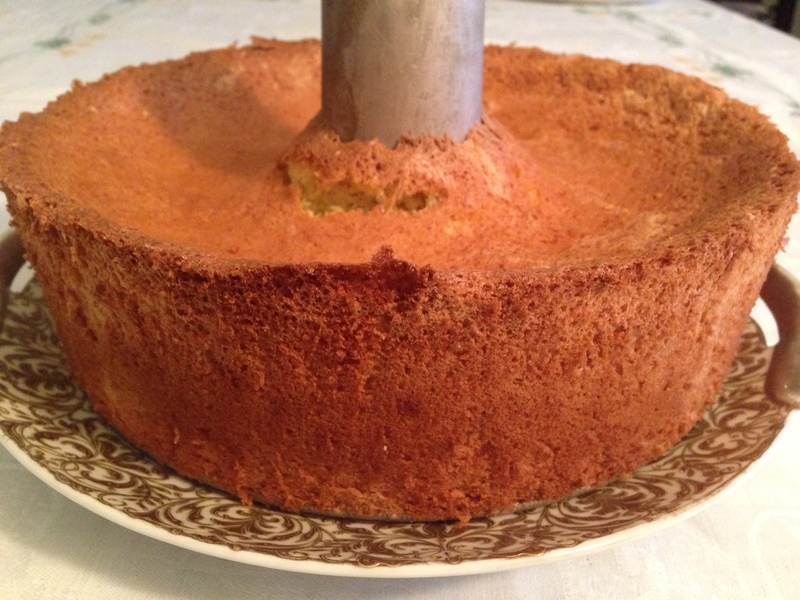 Use your fingers to separate it and make room for the stuffing. Using a tablespoon, spoon the stuffing into the pocket pushing down to make sure it extends all the way to the end of the breast. Then separate the skin from the breast and spoon the stuffing in between. Repeat with the remaining stuffing and chicken breasts ad place in an ovenproof dish. Salt and pepper the skins of the chicken breasts and brush with the remaining tablespoon of olive oil. Add the wine and water to the pan, and place in preheated 375° oven and cook or 20 minutes. After 20 minutes of cooking, glaze the tops of the chicken breasts with the honey and continue cooking for another 40 minutes, the breasts will be browned on top and cooked through. 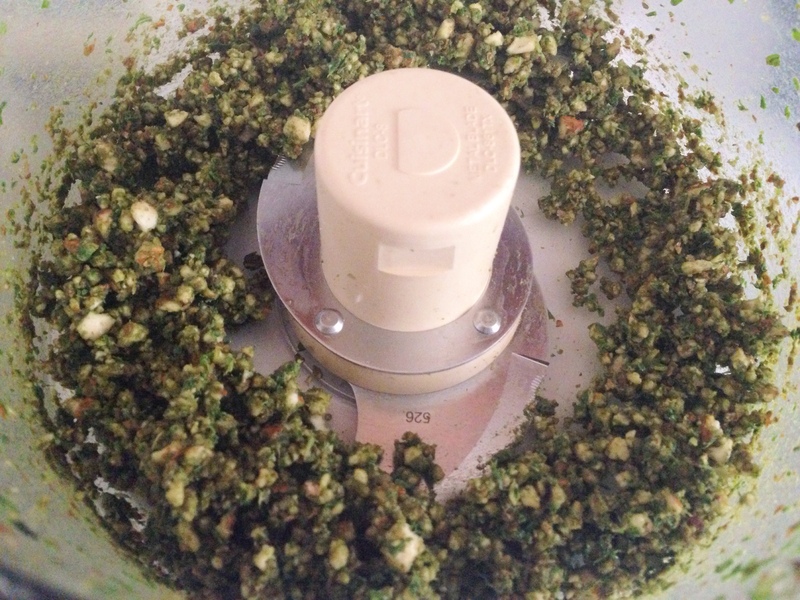 Combine the almonds and basil in a food processor and process until the almonds are pretty fine, with no big pieces. Add the almond basil mixture to a non-stick frying pan. Defrost and drain a box of frozen chopped spinach and squeeze the excess water out with paper towels until the spinach is dry. Tightly pack one cup of spinach and add to the frying pan along with the shallots. Chop the dried apricots into 1/8” pieces and add to frying pan along with 4 of the tablespoons of olive oil, the grated garlic clove, and salt and pepper to taste. Sauté for 3 minutes. Preheat the oven to 375°. 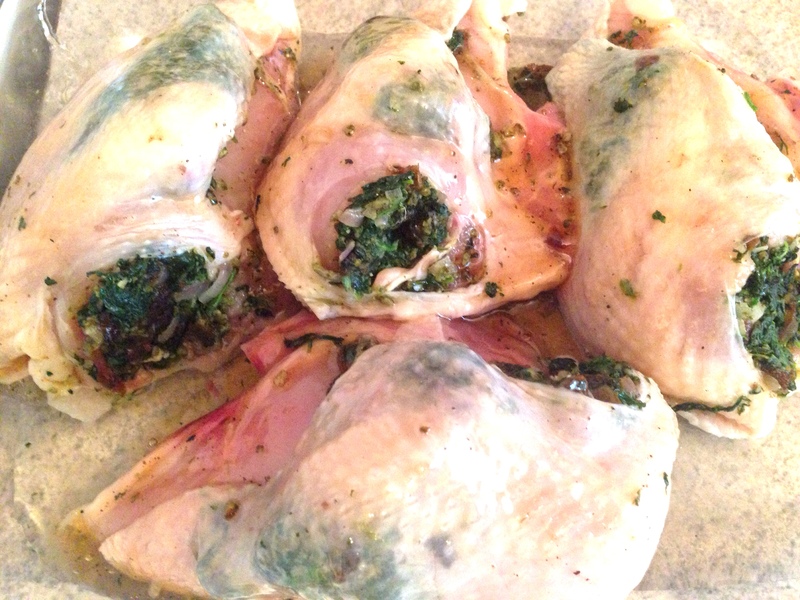 Stuff the inside of the chicken breasts, using the pocket by the joint, and place stuffing under the skin. 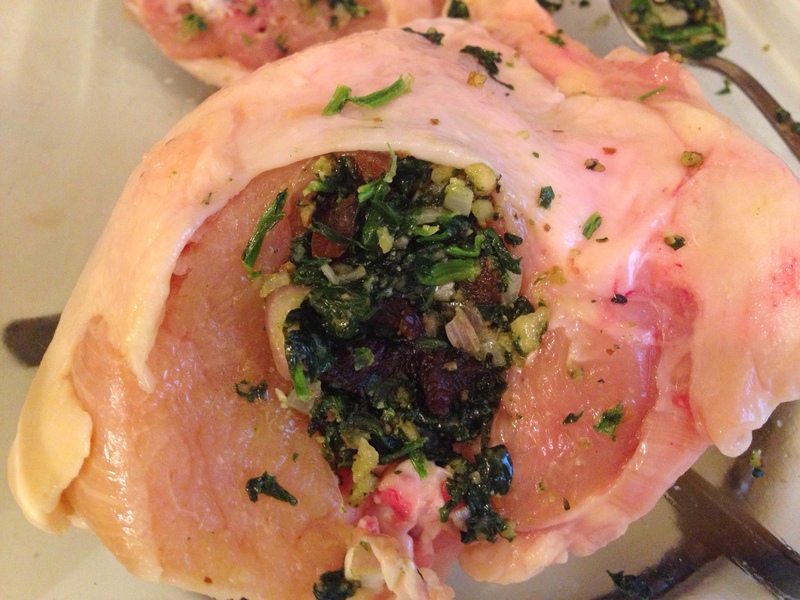 Repeat with the remaining stuffing and chicken breasts and place in an ovenproof dish. Salt and pepper the skins of the chicken breasts and brush with the remaining tablespoon of olive oil. Add the wine and water to the pan, and place in oven. After 20 minutes of cooking, glaze the tops of the chicken breasts with the honey and continue cooking for another 40 minutes, the breasts will be browned on top and cooked through. 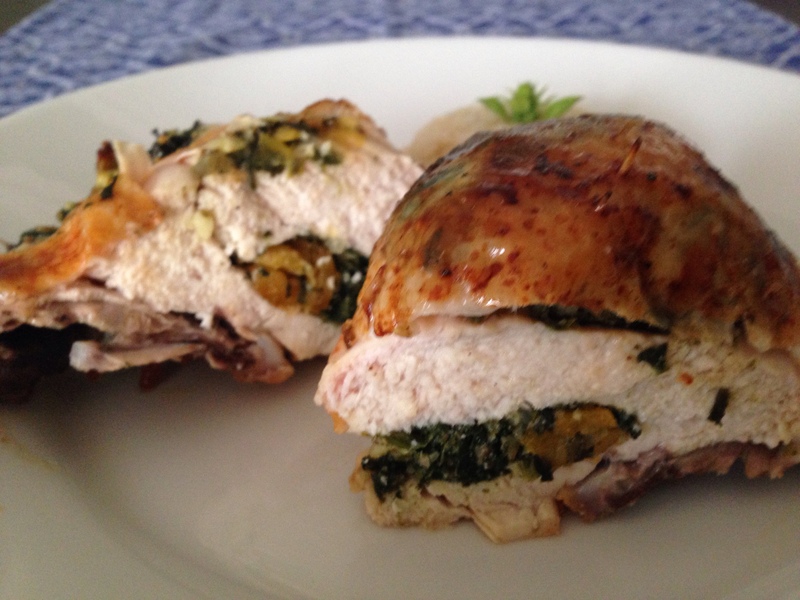 This entry was posted in Blog, Recipes and tagged basil, dairy-free, gluten free, honey, Rosh Hashana, stuffed chicken breasts on September 1, 2014 by Leslie. 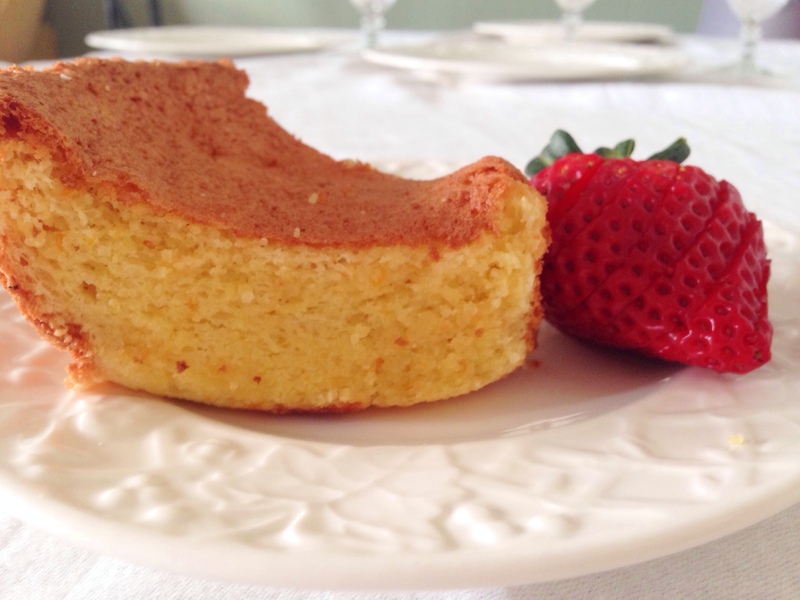 This is a recipe taken from my father. He didn’t cook a ton, but there were a few dishes he made quite well. 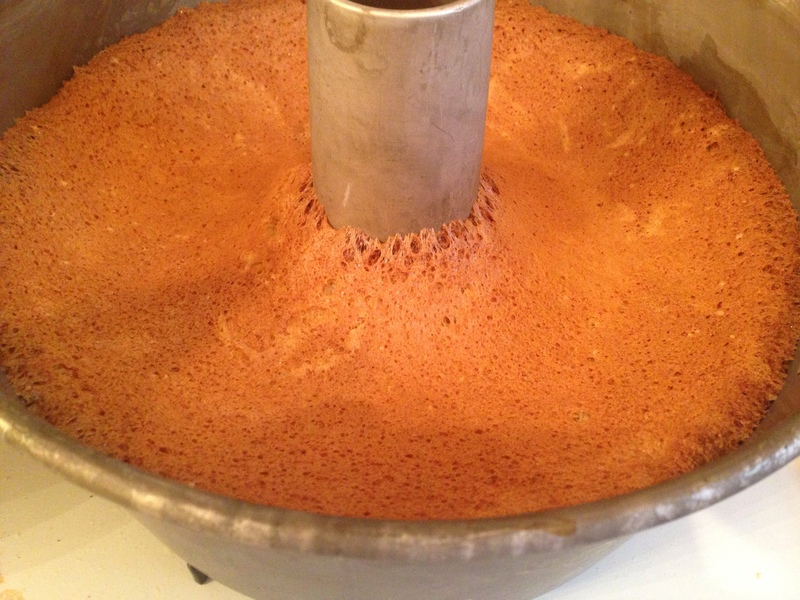 This is one of them that I doctored up with additional herbs for added flavor. These stuffed mushrooms are healthy, gluten free, no-carb and dairy-free. They are made with a secret flavoring ingredient: anchovies. The anchovy filets pretty much disintegrate when they are sautéed with the chopped mushrooms – so those who get haunted by the sight of anchovies on their Caesar salad but are fine with their flavor in the dressing, will like this recipe and may never know they’re in there. Their flavor adds a lot of seasoning and depth. They key is to finely chop the mushrooms and open up the caps to hold enough filling. I take a paring knife and slice around the mushroom cap and the gills and add them to the chopped mushroom mixture. This leaves a bigger cap to fill. The mushrooms can be cooked and then frozen for future servings. Just thaw out the mushrooms before heating them up. Preheat oven to 375°. Finely chop the stems from the pound of white mushrooms and the stems and caps of the crimini mushrooms. Add the can of anchovies with the oil, garlic, pepper, parsley and thyme, and sauté the mushrooms until the anchovies disintegrate. Line a baking pan with foil and place the mushroom caps on lined pan. Fill the mushroom caps with a teaspoon each of the filling. And bake for about 30 minutes, until the mushroom caps are soft and cooked. 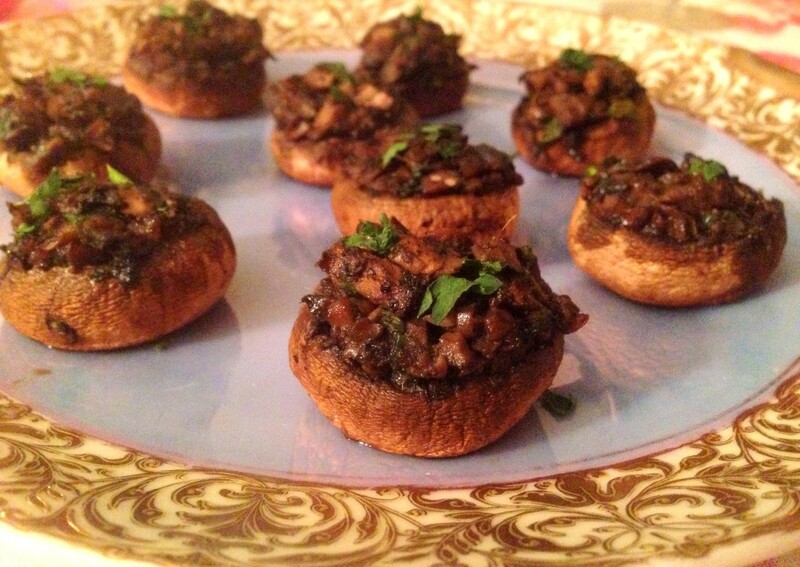 This entry was posted in Blog, Recipes and tagged anchovies, dairy-free, gluten free, low carb, stuffed mushrooms on September 11, 2013 by Leslie.